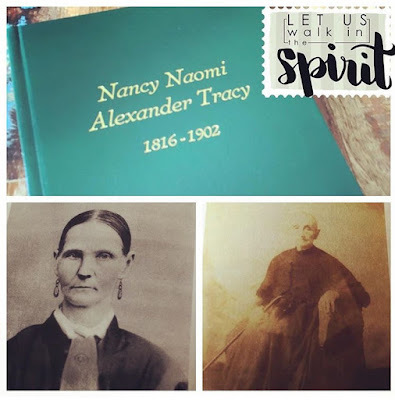 A few years ago I learned about Nancy Naomi Alexander Tracy , my 4th Great Grandmother. She was also written about in the LDS Church's magazine The Ensign, which made me want to learn even more about her. I had written about her on my blog and upon my research I found a blog that had a story about her. We wrote back and forth and found out we were 4th cousins. Her mom and taken Nancy Naomi Alexander Tracy's journal and got it printed into a book. I was so excited. She lived only 45 minutes from St. George, Utah which my family visits quite often. So one trip down we had a quick visit and I got a copy of the journal. I read through and read different entries. She truly suffered many trials and stayed not only faithful to the church, but positive about life. In Nauvoo, Illinois Nancy and her husband had already lost one son William Frances. He had died at two years old in 1842. It was three years later and they dug a grave next to William's and buried a second son Theodore Franklin who was also two years old. It was heart wrenching to lose another child. There had been trouble in Nauvoo and the members of the church had been threatened. They had to leave their homes, the temple and find a new place to call home. They soon realized they didn't leave their trouble behind. Almost exactly a year later they suffered another trial with their son Lachoneus Moroni. "Our second son, eleven years old, took his fish hook and line as he always did when we camped on a stream an went to the creek. He caught quite a string of fish and came up to the wagon and gave them to his older brother. Then he came to me and said, 'Oh, mother, my head aches so it seems all on fire.' It was about the middle of July and whether it was a sunstroke or brain fever, we could not tell. Of course, we could not travel on. We did everything we could under the circumstances, but he died on the third of August. This was indeed a trying ordeal to have to bury our dear boy here in the wilderness." I have watched my kids suffer illnesses and have different trials of their own, I couldn't imagine losing three children so close together. Nancy could have so easily given up and decided she wanted to stop running from those threats, leave the church and just live a quiet life, but she chose her faith, her family chose to stay faithful. The last thing that Nancy records in her journal has always had an impact on me. "...It is a marvel to me when I looked upon my past life, of my journeyings in poverty and of the persecutions, sacrifices, and suffering, that I am alive to tell the tale. It is more than the power of mortal man that has sustained and preserved me. I will now make and end to my narrative and perhaps in the future my children's children will read with some degree of interest this short history, although a hundredth part hath not been told. Farewell, Nancy Naomi Alexander Tracy"
I have loved her words and learned from them. I know that whenever I am going through a trial I can remember that I have a loving Heavenly Father on my side. Do you have a family story of trials and tribulation? What did you learn from their story?